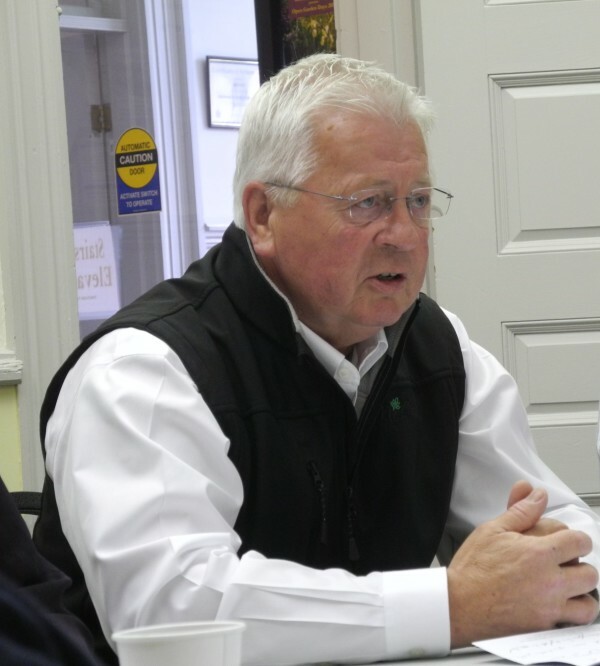 Jay McCrum, president of the family-owned potato processing plant Penobscot McCrum, appeals to Belfast City Councilors to access the new rail trail by going around his building, not right next to it as officials prefer to do. 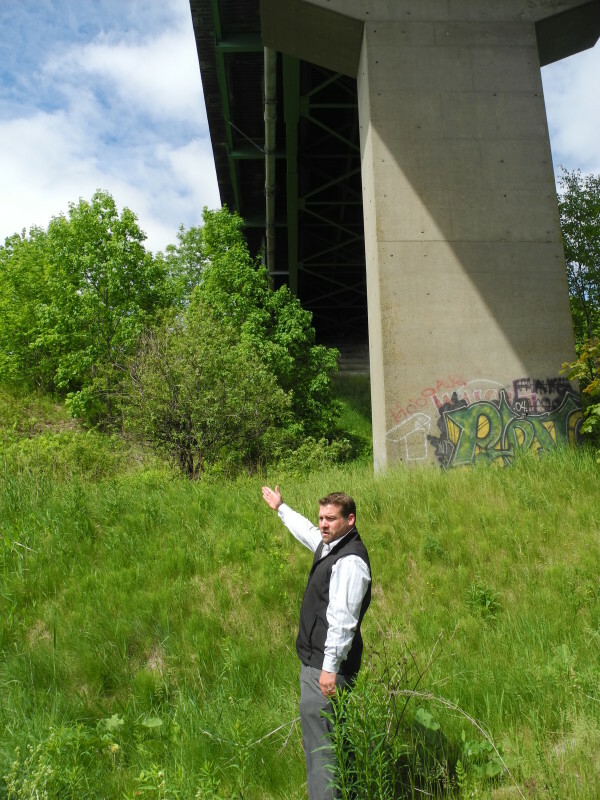 Greg Skafidas, a sales and marketing official at Penobscot McCrum, walks Friday along the route the city of Belfast would like to get an easement to use as a way of accessing the new rail trail. This week, councilors voted to use eminent domain to get the easement if necessary. Skafidas and others at the potato processing company pointed out that the desired path is narrow and travels close to the steep riverbank on one side and the propane tanks and the factory on the other. Greg Skafidas, a sales and marketing official at the Penobscot McCrum potato processing plant, points in the direction of the Goat Path. Company president Jay McCrum on Friday morning offered the city of Belfast $25,000 a free easement to use the Goat Path, an unofficial walking route, to access the rail trail. 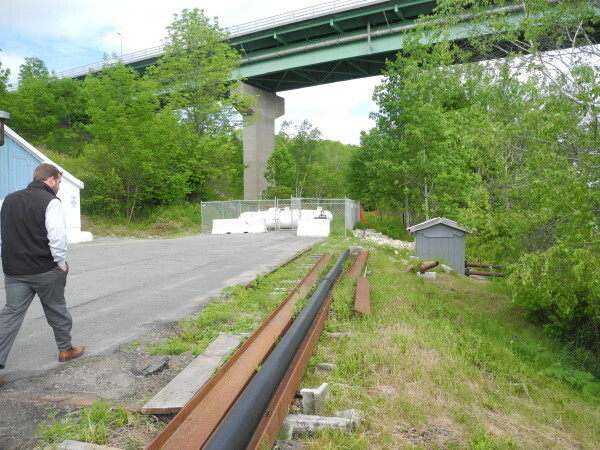 BELFAST, Maine — Days after learning that the city of Belfast is planning to use eminent domain to get across the Penobscot McCrum property to access the new rail trail from downtown and the Harbor Walk, Jay McCrum came to Belfast City Hall Friday morning to make a counter offer. The easement McCrum has in mind would bypass the potato processing plant completely, moving pedestrians up Bridge Street and then across River Street, a narrow road that overlooks the plant and the harbor. From there, the easement would continue into the underbrush, and the city would need to turn the existing, so-called Goat Path — an unofficial trail that wends through the underbrush and down the steep hillside below the Route 1 bridge — into an accessible trail that would connect with the rail trail. In contrast, the 14-foot-wide and 700-foot-long easement that Belfast officials desire essentially follows the path of the old Belfast-Moosehead Lake Railroad and is the flattest, shortest way of connecting the rail trail with the harbor walk. But it also would mean that pedestrians would have to coexist with large trucks delivering potatoes all day long, as well as with the propane tanks and the outside portion of the company’s refrigeration system that are in close proximity to that proposed easement. City Planner Wayne Marshall, who also was at the meeting, said that a prior engineer’s report indicated it could cost as much as $500,000 to turn the Goat Path into a safe, handicap-accessible trail. On Tuesday, City Manager Joe Slocum told councilors that for several years the city has been talking to McCrum to discuss ways to get across the property. Three months ago, city officials told McCrum that it was a matter of public necessity to get the easement and that Belfast would pay “full and fair value” for it, Slocum said. The city offered him $55,000 for a 14-foot-wide, 700-foot long easement across the property, based on an independent appraisal, and asked for a written response by the close of business on Tuesday, June 7, Slocum said. After hearing Slocum’s report Tuesday night, the councilors voted unanimously to pursue the eminent domain option to acquire the easement. McCrum said during Friday’s meeting that he strongly prefers the city find a way around the plant because he is concerned about safety risks if pedestrians were to walk through the busy corridor where the city proposes to build a path to get to the rail trail. At the narrowest point, walkable land is squeezed by the steep banks of the Passagassawakeag River on one side and the potato plant on the other. Councilors thanked McCrum for his offer and for his company’s investment in Belfast. Penobscot McCrum currently employs 180 people to process between 150,000 and 200,000 pounds of Aroostook County potatoes daily. But councilors also said they would need to make sure the connector path is accessible and would need to look again at the Goat Path to see how much it would cost to use it. “I think the answer’s going to be what does it take to get down from there? It’s a radical slope,” Councilor Mike Hurley said, referring to the Goat Path. City officials took the opportunity to ask McCrum what the company needs to satisfy its safety concerns about crossing the property, if it is determined that the Goat Path won’t work. Collins asked if a fence would help, or even a 24-hour guard. “I don’t know how to answer that,” McCrum replied. At the end of the meeting, city officials said they would go back to the Goat Path to look at it again and that they would like to meet with McCrum again soon. Later that morning, Penobscot McCrum company officials led two reporters on a tour of the Goat Path and the more direct path the city prefers. The officials showed how the direct path travels right next to four large propane tanks and next to a section of the river bank that was washed out during a heavy spring storm this year. When they looked for the Goat Path, it was hard to find at first, as a bamboo thicket hid the entrance off River Street. Once found, the path was initially muddy and flat before it hit the steep hillside by the Route 1 bridge. After the walking tour, McCrum said he appreciated the chance to speak with the entire council. He disputed the city’s claim, made Tuesday night at the council meeting before the eminent domain vote, that officials had been trying to come to terms with McCrum regarding trail access for years. McCrum said he thought he would have until July to respond to the city’s offer to pay $55,000 for the easement.